If you use a phone or a tablet and click a link that sends you to a Chrome Web Store page, you'll see this message: "Sorry, your operating system is not supported just yet. 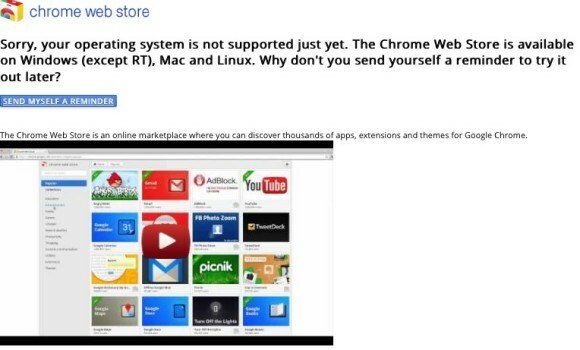 The Chrome Web Store is available on Windows (except RT), Mac and Linux. Why don't you send yourself a reminder to try it later?" What if you open the same page in Firefox, Internet Explorer or any other desktop browser? The page loads and you only see a short message informing you that "you will need Google Chrome to install most apps, extensions and themes". That's the right thing to do and it's surprising that Google doesn't load a page because "your operating system is not supported just yet". You can't install extensions if you use any other browser than Chrome (for desktop), but there are other reasons to open a web page. Maybe you want to read the reviews, write a review, check the screenshots. For now, you can install Chrome for Android or iOS and use the "request desktop site" feature to load the offending page. Google Play does a much better job: it not only loads in almost any browser and operating system, but it also lets you install applications remotely. Anyway, I think Chrome web store should be integrated into Google Play for consistency. Oh, and it is also hidden from the search results on the chrome web store, I had to use google to get to listing when I was looking for it. The desktop version of the CWS is almost unusable on my mobile because it is so heavily optimized towards real desktop machines. Trying to do simple things such as switching between the overview and comments sections make my mobile sweat real bad. There are occasions where I want to check a certain extension while on the go (e.g., to consider for installation once I'm back to my desktop) but the way the CWS is designed makes it impractical to me. "Google Play does a much better job: it not only loads in almost any browser and operating system, but it also lets you install applications remotely." has given me a similar idea: why couldn't extensions be installed remotely too? They sync anyway, so what would be the problem? I hope androids supported soon!Plus watchout on webstore, theres a malicious extension called nygoogle that is almost unremovable!